Sometimes, it doesn’t take an all-new model to distance itself from the pack. The previous Pilot was already a great choice for kids in the crowded midsize SUV market. With a little “refreshening” plus a few feature changes, you can make a good thing even better! That’s the case for the new 2012 Honda Pilot crossover sport utility vehicle. With an EPA rating of 18 city and 25 highway in front wheel drive trim, Honda claims it is the most fuel efficient 8-passenger SUV on the market! Honda also gave the EX-L and EX trim streaming audio and HandsFreeLink, a nice safety bonus to keep your hands on the wheel! Improved noise insulation is a nice improvement, also, as are the larger display and multi-view camera on higher trim levels. Many will appreciate the updated appearance. It actually *looks* like an SUV. Many buyers opt for an SUV over a minivan or station wagon, despite the many advantages of minivans. Often, this choice is made because of the soccer mom/dad minivan image. The funny thing is that many of today’s crossover SUVs are sleek enough that they look little different than a glorified minivan or wagon! That’s not the case with the rugged-looking Pilot. Some reviewers and buyers complain it is too boxy in appearance, but really, unless you actually need heavy duty towing or off-roading capability, isn’t that what sets apart a three-row SUV from a minivan? Well, there is at least one other thing:The Pilot sits relatively high, which helps with a view of the road in general. The long hood and wide pillars do detract from overall visibility, but it is a little better than average in the midsize SUV category. The downside of this is that the step-in height can be formidable for smaller kids, but still not as bad as a full-size monster SUV. The Pilot is also a little shorter than most minivans, making it easier to park and fit in the garage. Finally, AWD is available, of course, unlike most minivans. With 4WD option, you get modest towing (5,000 lbs.) and can do limited off-road driving. Though most families rarely do these things, for those that do, minivans really aren’t an option. While the second row is almost as functional as some minivans in terms of seating adults and kids, you’ll find the third row and cargo space behind the third row to be lacking compared to most minivans. With minimal legroom, it might seat two smaller adults on a short trip with the second row moved forward. Being low to the floor, it will keep their knees and thighs well above the seat cushion. It’s best suited for younger kids in seatbelts and will also fit two carseats. In fact, it has a full set of three top tether anchors and the passenger side seat provides one LATCH position! Unlike some competitors, the shoulder belts are properly mounted behind the seat and should work well for most kids. The main issues are the very narrow middle seat, the relatively narrow width overall and the short, rigid buckle stalks for the passenger and middle seat. The narrow spacing of those buckle stalks will make it very hard for kids to buckle themselves in most boosters, but very narrow boosters like the BubbleBum (photo, right) should work fine there. The third row does have a handy split-folding feature. The good news comes in that second row, where the middle seat is not just an afterthought. It should accommodate smaller adults and most carseats, too. Unlike the competition, it even has its own dedicated pair of lower LATCH anchors! Plus, the second row is wider than average, so it can fit various 3-across or adjacent carseat arrangements better than most other midsize SUVs. Even if you have a wide seat like a Britax Frontier 85 SICT, a small adult or older kid has just enough room in the middle to help care for baby in a Graco Snugride 30 (photo, left). The split 60/40 bench is also fully adjustable. It slides forward and back and all seats recline as well. That is a big help if you have more than a couple carseats or frequently have kids in the third row. The seatbelt buckles are all on flexible stalks, but are relatively short to provide a good compromise for carseat installation and for kids in boosters. Some lower LATCH anchors can be hard to access in both rows, but definitely not the worst I’ve experienced. There are a couple great spots to attach a rear-facing tether accessory strap for your Britax, Diono (Sunshine Kids) or Combi convertible (photo, right). How’s it drive? Nice! The main complaints I’ve had over the years with the Odyssey and Pilot are that the ride comfort and noise have generally lagged the competition. While they still don’t lead the category on these measures, the improvement Honda has made is much appreciated. Plus, overall performance is still quite good. The handling, acceleration and braking are all competent, thanks in part to high quality Michelin all-season crossover tires on my tester. You won’t find yourself thinking you are driving a car, but it’s quite reasonable for one of the larger midsize SUVs. I had no particular complaints around town or on the road. Fuel economy according to the trip computer was around 17 mpg on most trips, about what is expected for the 4WD version. Kudos to Honda for improving fuel economy, the area where midsize crossover SUVs still tend to be greatly lacking. Sadly, many don’t even get 20mpg combined EPA city/highway ratings like the new Pilot. In terms of safety and crashworthiness, there isn’t a lot I can tell you. The NHTSA and IIHS have not yet completed their testing of the 2012 model. I expect results to be at least as good as the similar 2011 model, since this is a mid-cycle refresh and not an all new model. The 2009-2011 model only lacked in terms of a marginal roof crush strength rating from the IIHS. From the NHTSA, the 2011 model received a 4-star overall rating in the new tests and did well overall in all the frontal and side impact results. The 2012 model has not yet been tested for side impacts, but retains good frontal crash test results from the government. 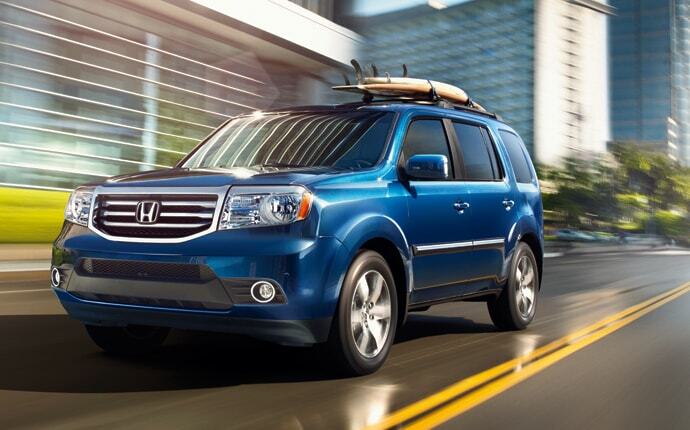 Update: The 2012 Pilot earned an IIHS Top Safety Pick award. The NHTSA gave it a 4-star overall rating, with 5-star ratings for the driver and rear seat passengers and 4-star ratings for the front seat passenger in individual crash tests. Very good overall. The interior features are simply awesome. The quality and appearance of the black leather interior in my tester were exceptional. Seat comfort is quite good in the first and second rows. Kids remain entertained with wireless headphones for the optional DVD entertainment system (photo, right). With the second row moved all the way back, a rear-facing infant seat behind the passenger leaves just enough legroom for average adults in front (photo, left). Even a taller rear-facing convertible like the Sunshine Kids [Diono] Radian fits well with LATCH in the second row middle with no impact on the front seat legroom (below, left). There’s plenty of room to puzzle the Radian next to a larger combination seat. The third row is compromised for adults, due to the legroom issues already mentioned, but there is enough for kids in a combination seat like a Graco Argos 70 (Similar to Graco Nautilus, below, right). Access to the third row is fine for kids, but somewhat narrow for adults. The cargo space behind the third row is among the best in the midsize class. Combined with 2nd and 3rd rows that are split and fold flat, there is a lot of flexibility for both cargo and passengers. The rear hatch opens entirely or you can open just the top glass section separately. Editor’s Note: The 2012 Pilot is not affected by the recent recall for a small number of defective front seatbelts. 4 LATCH positions + 2 additional top tethers! Quirks? Parking brake release handle. XM station tuning knob slow to respond. It’s sometimes hard to recommend anything but a minivan to families with lots of small kids. Top minivans cost less than similarly equipped SUVs. They get better fuel economy. They have more cargo space. The seating is more flexible for passengers, especially when carseats are an issue. Sliding doors are awesome for kids, too. Unless you need to tow more than a few thousand pounds or do heavy duty off-roading, why would you even consider an SUV? Of course, we understand the stigma of driving a minivan! I recently “downsized” from a minivan to an SUV after 10 years of driving a family truckster. With that in mind, the Honda Pilot sets the standard for seating kids and also for fuel economy in a midsize, 8-passenger SUV. It’s still no Honda Odyssey in terms of being family friendly, but it’s as close as you will find in in an SUV, with the possible exception of some monster SUVs that cost a lot more and get awful gas mileage! Plus, the Pilot is rugged-looking enough that no one will ever mistake it for a minivan or station wagon! Thank you to Honda and G. Schmitz & Associates for providing the Honda Pilot Touring 4WD used in this review. I do have a question about 3rd row access that I’m hoping you might be able to answer. I have a 2012 Pilot with three Britax seats: an 85 behind the drive seat, a Secure base/carrier system for infant in the middle of the second row, and a booster with back/headrest (I don’t remember the model number) in the 3rd row LATCH position (passenger side only). My question is based on the setup shown in your post showing a rear facing seat in the 2nd row passenger position and a seat in the 3rd row passenger position. How does the child get access to that 3rd row? I don’t think the 2nd row passenger can move to grant access with a rear facing seat (currently, a carrier for me, but soon a rear facing Marathon). Great review! We are currently looking at getting a 2012 Pilot after owning the Volvo XC 90. We have 3 kids (ages 6, 3, 1) that are in a Britax Frontier 85, Britax Marathon FF, and a rear facing Britax Marathon. Can these all fit in the 2nd row? Eventually, our 3 year old will be graduating to a FF Britax Frontier as well (which would mean 2 frontiers FF and a Britax Marathon FF. We are planning to try this at the dealership but would be nice to know if we are crazy for attempting it before we even get there. Also, if all carseats don’t work together in the 2nd row, would you feel safe with a 6 year old back there in the FF Britax Frontier? Thanks! Thanks for the information. Do you know the lower anchor LATCH weight limits? On earlier Honda Pilot Models it is 40 pounds. So the Britax Booster shown here would not be compatible with the Pilot. Kind of unfortunate since most vehicles LATCH limit is 48 pounds. This means you can not use the 5 point harness system, which is generally considered safer for kids than the three point vehicle belt. Hi Heather, Do you mean the rear-facing tether accessory strap around the front seat leg? As long as the strap is around a structural piece of metal fixed to the floor, it doesn’t really matter if there is some plastic trim in between. Of course, for tether used on a front facing seat, you always want to attach directly to the designated top tether anchor specified for that seating position. I did not realize there might be an airbag sensor in the leg of the seat. If that is the case, it might also be worth trying the other leg on the same seat to see if that helps also. Rear-facing tethers are completely optional, as rear-facing child seats are so safe even without them. So if you find it is causing an issue with your airbag sensors, you may want to stow it away and not use it at all. We are very interested in the pilot but still have a few questions. 3rd row access is probably the most important feature that we are looking for so here is my question. My wife is pregnant with twin girls and we currently have a 6 year old and a 16 year old. Our goal is to have two infant car seats behind the driver and middle seats for the hopes of being able to access the third row from behind the passenger. I saw a picture that show this but we need to make sure this works with infant car seats. Any help would be great. The Radian is among the taller seats on the market and also installs pretty reclined in many vehicles. I would guess that you might not be able to install it in the center with the driver seat moved all the way back. Definitely not behind the driver or passenger. Unfortunately, I no longer have access to a Pilot to try this. I am sure some smaller convertibles would fit with the driver seat all the way back, especially in the center. There is also a chance you could use the Diono Radian Angle Adjuster to allow this to work in the center seat of the Pilot, but again I could not say for certain, sorry! Nice review. We have a 2012 Pilot and are considering the Radian RXT rear-facing in the middle of 2nd row. In your photo above, is this possible with the drivers seat all the way back? I have the 2012 Pilot and have twins that I’d like to have seated behind driver and center. Chicco Keyfit 30’s have worked perfectly for this, but we need to upgrade up convertibles now. Would two Diono Radian RXT’s fit? I’ve also been looking into Britax seats. Great review. I currently have a ’10 Forester with a rear-facing car seat installed behind the passenger seat. I’m 6’3″ and do all the driving when the wife and kid are in the car, as we have have move the passenger seat up fairly far to accomodate the car seat. Question: are there any SUVs that will accomodate a rear-facing car seat but not requiring to move up the passenger seat? Or do you need to have the car seat in the middle to have both driver and passenger seats all the way back? The larger midsize models that have 2nd row captain’s chairs that adjust fore/aft should accomodate a typical rear-facing convertible without losing much front legroom. Of course, some of the taller covertibles (say Diono Radian in the photo) may not fit when reclined, but a midsize model (say Britax Boulevard 70 installed a little more upright for an older toddler) should work fine. Minivans like the Honda Odyssey have more room overall if this is a factor. Darren, good info on the 2012 Honda Pilot. Please clarify your information/photo showing a floor tether option in the 2nd row (second photo in fifth paragraph). This is not a Honda installed safety feature. We just purchased a 2012 and asked for that feature per your post. Our dealer stressed your info presents a third party install and it is not an official engineered safety feature for the Pilot or any Honda. Tell your readers to not expect it when considering the Pilot. Most car seat back tethers have long straps. The dealer encourages threading the straps underneath the seat and latching to the factory installed anchor on the back of the seats when installing rear-facing seats. This follows the engineered LATCH safety standards for the vehicle as well as the engineering of the car seat. Your other info was helpful and the Pilot is great for our family of four. Thank you. I apologize for the confusion. The rear-facing tether accessory strap is not provided by Honda or any automobile manufacturer. It is provided only by a few manufacturers of some convertible carseats, notably Britax and Diono (formerly Sunshine Kids) that were mentioned in the text. The instructions of these convertible carseats will indicate how to attach this accessory to use a rear-facing tether system. Please note that the photo of the accessory strap you mention is showing the leg of the front passenger seat, to be used for a rear-facing convertible seat in the second row captain’s chair. Using a rear-facing tether in the manner suggested by the dealer may be contrary to the child restraint manufacturer instructions, so please be sure to read the child restraint owner’s manual before doing so. Also, please keep in mind that using a tether rear-facing is an optional feature on those convertible carseats that do permit it. So, if you have any concerns, you may simply opt not to use the tether when rear-facing. If you have any questions, please let us know! Is that a Frontier next to the RFing Radian in 2nd row? My son who will be 3 in 5 weeks is currently FFing in a Blvd 65/classic and we have new baby due next month who will be in a KeyFit 30 initially. I was not able to fit the FFing Blvd (driver outboard) and KeyFit (middle) side by side on the 60 split in our 2011 Pilot, but can fit side by side with Blvd on passenger side 40 split. When baby outgrows KeyFit we were planning on passing Blvd to her and getting Frontier 85 for my son who would be almost 4 at that point. I would LOVE to be able to have both seats on 60 split to have easy 3rd row access with 40 split unoccupied by a CR. I have no idea if Frontier and Blvd will puzzle on 60 split but looks like you had good luck with Radian in the middle. Glad to know that may be an option. I love having dedicated LATCH for all 2nd row positions. Yes, that is a Frontier 85 SICT next to the Radian. They happened to puzzle well next to each other, but of course another convertible and infant seat may or may not work as well. Can a rear-facing Radian fit in the last row? I think you may need to use the new Diono rear-facing wedge and then move the 2nd row seat forward a bit. Unfortunately, I did not have one to try so I cannot verify this for sure. It might even work without the edge, but you would compromise legroom of the second row in front of it. I <3 this new Pilot! We have a base model '06 Pilot and it serves our needs very well but this new Touring model is drool-worthy. Thanks for the great review! Great review, Darren – thanks!